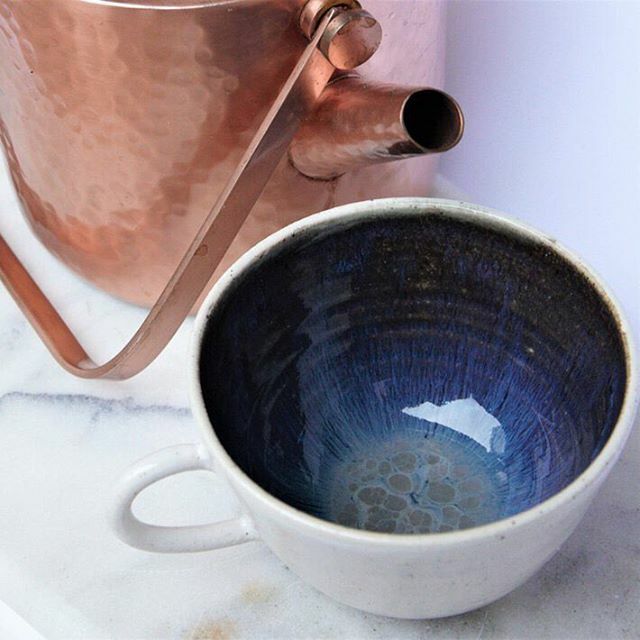 This week we spoke to the incredibly talented Elizabeth Macneal, of Limehouse Ceramics, about the process behind her beautiful clay creations. Read ahead to hear how she works the clay and her tips for aspiring makers and designers, and don't forget to check out her profile on the Shopping With Soul directory. Hello Elizabeth! Tell us a little about yourself! I'm a potter based in Limehouse, East London. I make all of my ceramics in the glorified shed at the bottom of my garden. Last year I quit my job as a management consultant to pursue pottery and writing - I definitely do not miss a life of spreadsheets and PowerPoint. What’s the process behind creating a new product? How long does it take you from inspiration to final product? First of all I wedge the clay - this removes all of the air bubbles. After cutting and weighing the clay (e.g. a big mug is 550g), I throw each piece on the wheel. This is probably my favourite part - when a piece takes shape. I don't tend to follow any structured inspiration process (e.g. working from drawings) - I'll just experiment as I go, usually at this stage. After drying out for a day, the piece will be 'leather hard', which means it can be handled easily and trimmed. It's at the right consistency to add a foot ring, handle, or smooth off any imperfections. Once the piece is bone dry - which takes about four days - it's ready to be fired for the first time to 1000C. This removes all the water and makes sure it is still porous for absorbing glaze. I dip or paint on the glaze, then fire it a second time to 1240C, so that the clay vitrifies and the glaze melts. From start to finish, it will take about 2 weeks for each piece to be made. I always love opening the kiln after a glaze firing - and seeing the glossy colours inside. What is the most challenging part of the process? And your favourite? The most challenging part is probably the glazing. This can lead to the biggest inconsistencies - pieces are often ruined if the glaze is too thick or thin. My favourite part is definitely throwing - I never fail to be amazed that a ball of earth can be turned into a vase or a mug or any circular shape I'd like! What one piece of advice would you give to a new designer maker who is just starting out? Try a market. They are great for feedback - you can see which designs are working and which aren't. You can also work out your pricing - if something doesn't sell, it's often because I've priced it too high, and markets are a very easy way of determining this. Also, build up your Instagram. As well as being a lovely way to connect with customers and get feedback, it's also where I get almost all of my online sales. With the rise of 'cool' markets, the increased connection with handmade products, and the ease of using marketing tools like Instagram, I don't think there's been a better time to start out as a small maker. What’s next for Limehouse Ceramics? Do you have any new projects in the pipeline? I always have new designs coming out - I have a pretty low boredom threshold, which definitely makes it tricky to keep my website updated, but it also keeps the work enjoyable. In the coming months, there'll be teapots, new teacup designs, and some serving bowls.